Buffalo chicken wings are usually served with a few sad sticks of celery. What is the celery for exactly? To assuage our guilt from indulging in deep-fried wings smothered in flaming hot sauce and dipping them in blue cheese? I have decided to turn the buffalo wing appetizer on its head. Instead of a plate piled with wings, I am going to serve a plate piled high with celery. No, I am not kidding. 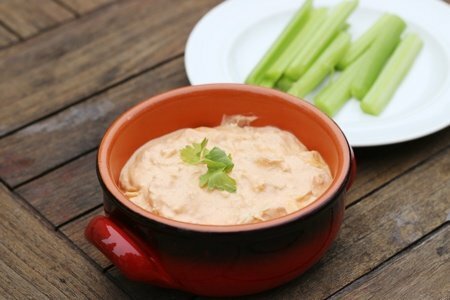 The celery is to be dipped in creamy buffalo chicken dip that will hit that deep craving for spicy chicken AND you won’t be inhaling all those calories. This dip is GOOD. Like scoop it and eat celery without noticing you are eating celery gooooood. For the chicken, I used a frozen boneless chicken breast that I had banging around my freezer. I thawed it and cooked it in the microwave and then I chopped it into small pieces and shredded it with two forks. This would be great at a game day party – you could keep it warm in a small slow cooker or a fondue pot. Do not (I repeat) DO NOT serve it with chips (okay, you can if you really want to – I can’t stop you as I don’t know where you live). What do you serve on game day? Mix chicken breast, greek yogurt, Neufchatel cheese, cheddar, and buffalo sauce in a sauce pan. Heat until cheese is melted and mixture is hot. Serve immediately. How do you microwave a chicken breast?! This would change my life! BTW, if I need cooked chicken in a hurry, I poach it. It works out. Actually, the original Anchor Bar "Buffalo" hot chicken wings were never meant to be dipped into the blue cheese. That is only for the celery, to "cool the tongue" after chowing down the spicy meat.Folks who dip the actual wings in the dressing are committing blasphemy! (and besides... YUK!) :D.
OH BOY - I have some left over BBQ chicken so guess what is for dinner tonight!! @Kate - I don't recommend microwaving a chicken breast if you are going to eat it plain because it gets a bit dry. I covered it and heated it for 2-3 minutes on high - and slice it in half to make sure it is cooked through - cook it more if it needs it. @c- de-buffalo! What are you talking about? :) Maybe you could use ranch seasoning and make it "chicken ranch dip" instead of hot sauce. I should try that before I suggest it.